This game may not be as well known to you as many of the other board games that I have covered in The Gaming Corner, and that is because the game is relatively new. It was released only 20 years ago, which probably makes it younger than the majority of people reading this. It is a 2 to 5 player game designed by Alan R. Moon and it has won over a dozen awards since it was released. The goal of the game in a nutshell is to score more points than the other players. And how do you get points you may ask? Well, that is what I am going to tell you. Set Up: First, you put out the beautiful board. Around the outside is a score tracker to record your current score during the game. 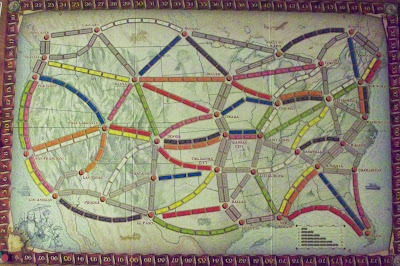 The rest of the board is a map of the United States (with a little bit of Southern Canada and Northern Mexico) showing a selection of cities and the train routes connecting them. Each player then takes 45 train tokens and their scoring piece of the color of their choice. 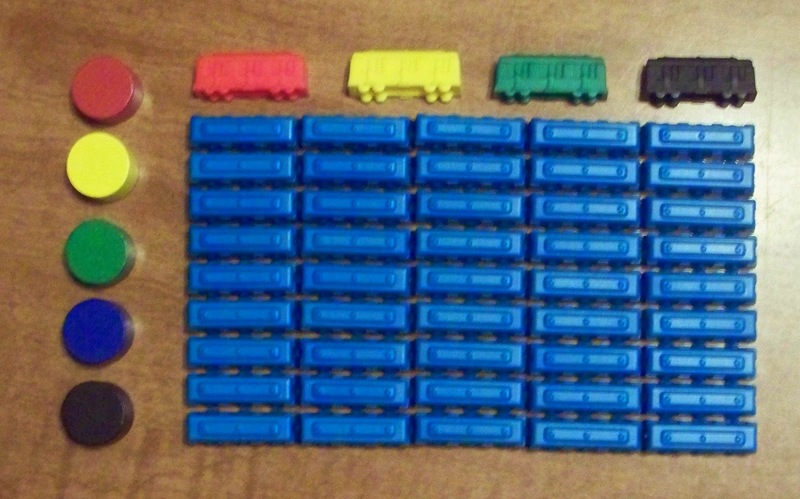 Be careful to only take 45 trains as your box probably came with 2 or 3 extra trains of each color to cover for the eventual loss that is bound to happen if the game is played a lot. 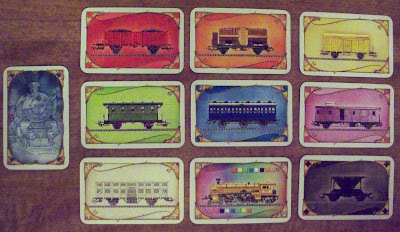 Next we move onto the train cards. The gold cards are wild cards and can be used as any color. Gather the train cards, shuffle them, and deal 4 to each player. Then, 5 train cards are placed face up along side the board with the remaining train cards placed face down next to them. This makes the drawing area. We then move onto the destination cards. 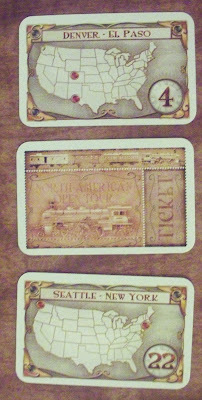 Each destination card has two cities depicted on it as well as a point total in the bottom right corner. The scores range from 4 to 22. Shuffle the destination cards and deal 3 to each player. Each player may choose to discard one of these cards if they so choose. Discarded destination cards are placed on the bottom of the destination card deck which is also placed near the board. But how do you know which cards to keep? During the game, you will be claiming the train routes on the board and if, at the end of the game, you have connected the two cities on the destination cards with a continuous path of trains of your color, then you win the points on the destination card. If you kept the cards but didn't claim the routes, you lose the points. Game play: After all of that, you are ready to play. 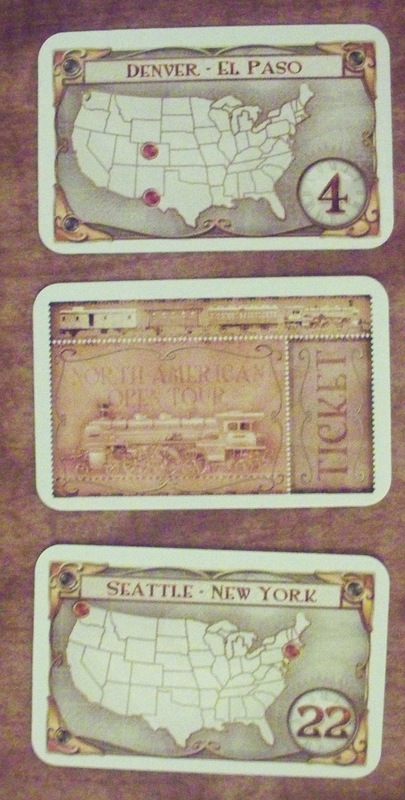 On your turn, you can do one of three things: draw destination cards,draw train cards, or claim a route. Draw Destination Cards: Take the top three cards from the destination deck. You may then return one or two of drawn cards, but do not have to return any if you don't want to. Draw Train Cards: Take one of the face up train cards or make a blind draw from the deck. If you take a face up card, immediately replace it with another face up card from the deck. Then if you didn't take a face up gold train card (the wild one) from one of the face up cards, you may take one more non-gold train card, either from the face up or the top card of the deck. If you draw a gold train card from the deck, it doesn't prevent you from drawing a second card. 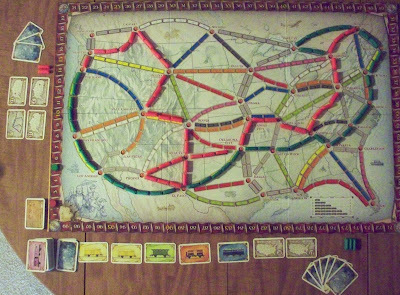 Claim a Route: To claim a route, you need to discard a number of train cards equal to the number of spaces depicted on that route on the board. 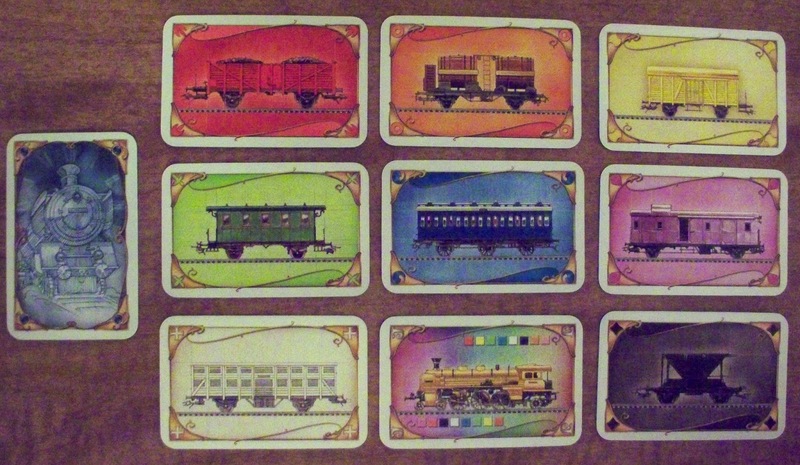 If the spaces are of a color, the turned in train cards must all be of that color (or wild cards), but if the route is made up of grey spaces the color of the train cards doesn't matter as long as they all match. When you claim your route, place a train token of your color on all the spaces on that route. Some routes are double-routes, with two routes connecting two cities. When claiming these, make sure to put your trains on the correct side of the double-route as another player can use the other one. You are never allowed to use both sides of a double-route and in two and three player games, no one is allowed to use second half of the double routes. 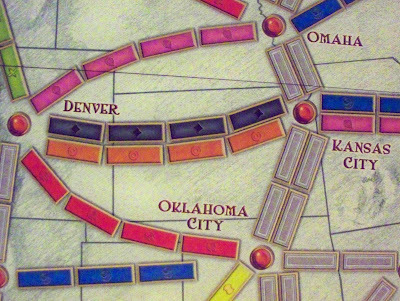 Example time: In the picture above, four pink trains would need to be discarded to claim the route from Denver to Omaha. Being a double route, four black or four orange trains would be needed to claim the route from Denver to Kansas City. Omaha to Kansas City takes only one train card and it can be of any color. Scoring: The only way to score points during the game is claiming routes. Depending on the length of the route, you gain a number of points. There is a handy dandy chart on the board, in the instructions and on a player guide card so you won't have to memorize this. The points gained are as follows. Right after claiming your route, move your score piece along the edge of the board equal to the number of points you gain. If at the end of the game you think your score is off, you can always count up each of your routes again to make sure the points are accurate. Ending the game: When any player ends his or her turn with 2 or less train pieces not on the board, every player (including the one who started the end game) takes one more turn. The game is then over. End of the game scoring: At the end of the game, you take each of your destination cards and see if you have trains connecting the two cities. If you do, no matter how direct or out of the way the trail of the trains take you, score the number of points listed on the card. If not, you lose that many points. 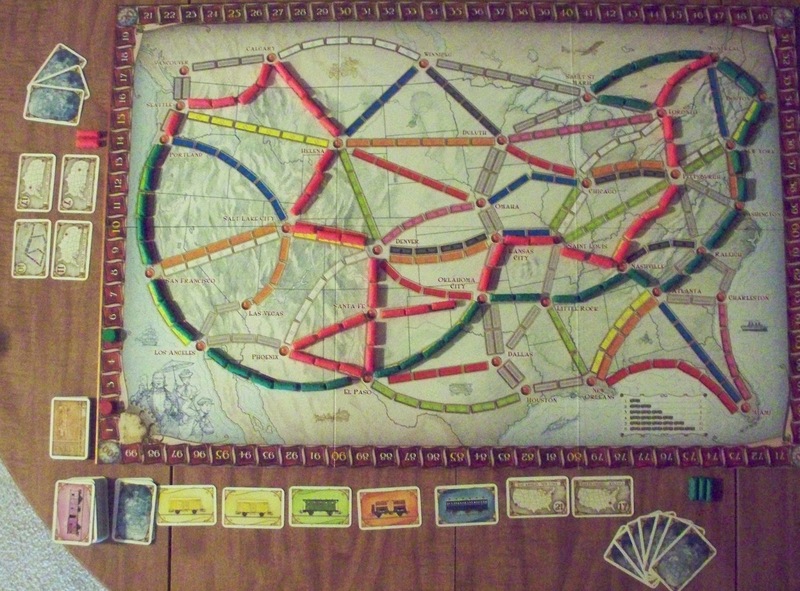 Also the player with the longest continuous route of trains gains 10 additional points. The player with the most points win. If you would like to see some celebrities (Amy Dallen, Colin Ferguson, Anne Wheaton, and Wil Wheaton) play Ticket to Ride, you can watch it on the YouTubes here. After watching about 5 minutes of the actual game play, you should be able to play it yourself; the game is just that easy. There are about a dozen 'other' Ticket to Ride such as Ticket to Ride: Europe or Ticket to Ride: Nordic Countries, and each are basically the same game. The boards are just different.